Enjoy watching the boats while strolling along Harborview Drive. Why go now: The sun is shining on this mile-long harbor town, where you can set sail or just watch ’em go. Dress code: Visor and tennies. Unofficial community center: Grassy Skansie Brothers Park (3207 Harborview Dr.), the spot for live music, farmers’ markets, and outdoor movies. Free (boat) parking: Jerisich Public Dock (3211 Harborview). Treat to try: Waffle cones with espresso almond fudge from Kelly’s Café and Espresso ($; 7806 Pioneer Way; 253/851-8697). Reason to return: Apprentice for a day on the 65-foot Shenandoah at the (4121 Harborview), reopening in August. 98 stairs to a photo op: The Finholm View Climb (8826 N. Harborview). Paddle-in picnic spot: The , on a sandy spit. Mark your calendar: For the sailor scene that is the (Jun 5–6; Skansie Brothers Park). Stay the night: Let the tide lull you to sleep on a house­boat (from $125; 3215 Harborview; ) moored in the middle of the harbor. 1. Walk the walk: A summer stroll really doesn’t get any better than Harborview Drive. Start the 2.5-mile trek at Old Ferry Landing Park (2700 Harborview) and wind along the harbor to Crescent Creek Park, where chinook and coho return to spawn in fall. Pass landmarks like the Fisherman Memorial, Eddon Boatyard, and Harbor History Museum, with the sail-studded harbor as your backdrop every step of the way. 2. Way better than any aquarium: Why bother with admission fees and crowds when kids can play with seastars, crabs, and anything else right under the dock? Naturalists from set up free “touch tanks” in Skansie Brothers Park and lead “Pier into the Night” programs, when underwater lights usher in all sorts of cool creatures. See website for schedule. Old boats get a new lease on life at Eddon Boatyard. 3. A boatyard reborn: Be one of the first to tour the newly renovated , saved from the wrecking ball by a small town committed to its big maritime heritage. You’ll hear the hum of the Gig Harbor BoatShop as old (and young) salts restore vessels originally designed and built at Eddon in the late ’50s. Free tours Sat; see website for classes; 3805 Harborview. 4. To-die-for clam chowder: The Tides Tavern is a real locals’ hangout and worthy of the crowds waiting for a waterside table—and a bowl of legendary chowder and must-order fish and chips. Try the halibut, and don’t skimp on the housemade tartar sauce. Boaters take note: Tides now has kitchen-to-boat delivery. $$; 2925 Harborview; 253/858-3982. Take home the catch of the day from Minterbrook Oyster Company. 5. All-you-can-carry oysters: Bring home a taste of Puget Sound from , a few miles from Gig Harbor. The view of Mt. Rainier over Minter Bay alone is worth the trip. Try a jar of fresh-shucked oysters; ask for specialties like the Yearlings or Ocean Pearls; and don’t skip the smoked salmon. Closed Sun; 12002 114th St., Key Peninsula North. 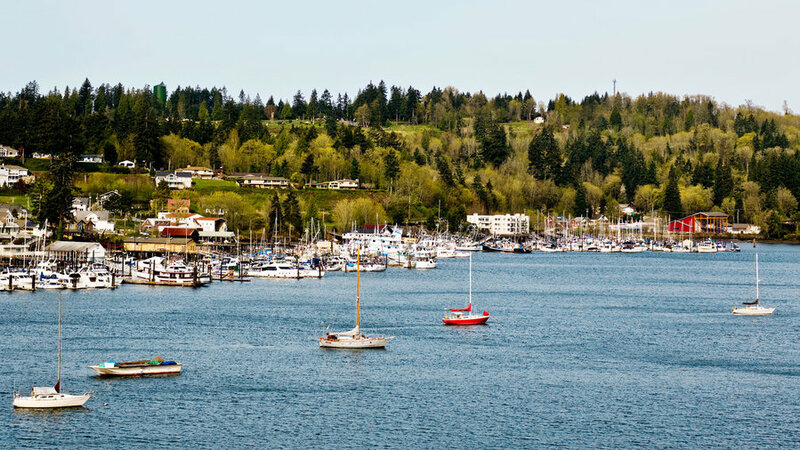 By kayak: Guided by a Gig Harbor local, skirt the harbor perimeter during a 2½-hour tour with ($60; reservations required; 3306 Harborview). Or rent your own kayak through (from $16; 8829 N. Harborview). Canoes, power boats, paddleboats, and rowboats also available. Take a guided tour around the harbor, or rent a boat and explore Gig on your own. By sailboat: With , you can learn basic sailing skills like how to steer and trim—or, of course, just enjoy the quiet billow of the wind and sail propelling you around Puget Sound. Closed Sun; $69 per hour (two-hour ​minimum); reservations required.